"About 5 years ago I was at home in Aarhus, Denmark, expecting a visit from a friend. There's a buzz at the doorphone, and I go out to let him in. But I can hear he's not opening the door downstairs, so I stick my head out of the window to see what's up. My friend is standing downstairs alright and I ask him why he doesn't come in. He just pointed up and said "look at that!" And there above the houses this big metal-tube was silently floating across the street... It was actually flying this low - about 20-25 meters over the street. It was there for a few minutes, it just floated across the street and disappeared behind the house you see in the picture. Sometimes both ends of the cylinder are abrupt i.e. don't taper off, like "oil barrell" or "coke-can" (e.g. Colares Brazil 1977), othertimes one end is pointed and the UFO is bullet-shaped. Large cigar-shaped UFOs are often reported to be surrounded by a luminous "foggy haze" or cloud. Cigars may have luminous "portholes" / "windows" emitting light along their length. Large cigars may also have one or more "rings" / "stripes" / "bands" of different color around them. Earlier reports of a giant cigars, width about 1/6th of their length, include a sighting on 28-Nov-1942 during WWII raid on Turin Italy by a crew of a Lancaster (src: official British Royal Air Force files), the "ghost rockets" of the summer of 1946 (primarily in Sweden, about 2000 "ghost rocket" sightings were logged between May and December 1946, with peaks on the 9 and 11 August 1946) and the 8-Jan-1956 at Weddell Sea Antarctica by 4 scientists from Chile estim. 450ft (137m) long and 75ft (22m) in diameter. 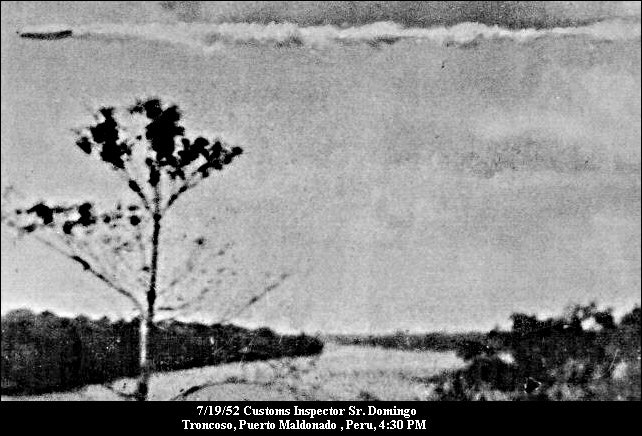 Puerto Maldonado, Peru 1952 a strange "fat fuselage" shaped object with trail, published in a newspaper on 19-Jul-1952. Enlarged photo: p1, p2. Note: AFAIK there are conflicting dates for this photo in FOTOCAT - but if it was taken in Jul-1952, one should note it coincides with the major UFO wave of that period (between 13-July and 29-July of 1952), reportedly the biggest UFO wave on record, when UFOs also flew over Washington, DC. More in our UFO summary and essential reading page. Note2: The case file makes reference to a thick trail left by the UFO. There are several cases where a white and fibrous substance, known as "angel hair", was left by the UFO. Twenty UFOs, described as "shiny silver spheres," flew over a number of farms near Quirindi, New South Wales, Australia last weekend, littering the ground with cobweb-like filaments called "angel hair." According to USA Today, "Residents of a small Australian community swear that they saw cobwebs fall from the sky after UFOs passed overhead. Dozens of residents of Quirindi called Australia's National UFO Hotline after the incident." According to the Tamworth, N.S.W. North Daily Leader, "Mrs. E. Stansfield, 61 years (old), said that she saw cobwebs falling from the sky. She saw twenty silver balls which passed overhead. Related: The UFO that Bruce Fenstermacher saw in 1976 near Warren Air Force Base in Wyoming was shaped like "a pregnant cigar" (src: UFOs-Nukes press event 27-Sep-2010). Related #2: A fiery silvery fat-"fuselage" / dirigible UFO was observed by NASA aeronautical engineer Paul R. Hill. It was Hill's second sighting and occurred in 1962, while being driven in a car in traffic. The time was about 4:00 p.m. and a storm was clearing. A heavy cloud layer with a bottom at 3000-4000 feet lay over Hampton Roads and the lower end of Chesapeake Bay. Hill would later use the cloud layer data to calculate the acceleration and final velocity of the object. "...it began to accelerate very rapidly and at the same time emit a straw-yellow, or pale flame-colored wake or plume, short at first but growing in length as the speed increased until it was nearly as long as the object. Also, when it started to accelerate it changed from a level path to an upward slanting path, making an angle of about 5 degrees to the horizontal. It passed us going at an astounding speed. It disappeared into the cloud layer. in what I estimated to be four seconds after the time it began to accelerate. The accelerating distance was measured by car odometer to be 5 miles." UFO sighting in Plutarch's "Parallel Lives"? Plutarch (46-120 CE), Greek historian, philosopher and biographer, born in Chaeronea in Boeotia. He was educated in Athens and is believed to have traveled to Egypt and Italy and to have lectured in Rome on moral philosophy. Best known are Plutarch's "Parallel Lives of the Noble Greeks and Romans" usually simply known as "Lives", a series of 46 biographies of Greek and Roman statesmen. "αλλ’ εξαίφνης του αέρος υπορραγέντος, ώφθη μέγα σώμα φλογοειδές εις μέσον των στρατοπέδων καταφερόμενον, το μεν σχήμα πίθω μάλιστα, την δε χρόαν αργύρω διαπύρω προσεοικός, ώστε δείσαντες αμφοτέρους το φάσμα διακριθήναι, τούτο μεν ουν φάσιν εν Φρυγία περί τας λεγομένας Οτρύας συμβήναι το πάθος"
Since I'm a native speaker of Greek, I should note that in the original text version above, the object is said to be shaped like a "pithari" i.e. oval, and to come down between the two armies. The object is not said to crash into the ground, and there is no reference to either noise or explosion. Summary: This page offers a list of 100+ articles, papers and monographs about UFOs / UAPs published in professional journals and specialty publications. Two polls of professional & amateur astronomers respectively, on whether they see UFOs or not. Finally 60+ PhD dissertations and academic publications about UFOs. Very little peer-reviewed literature has been published in which academics have proposed, studied or supported non-prosaic explanations for UFOs. Nevertheless, UFOs as a cultural phenomenon continues to be the subject of academic research (UFOs are typically portrayed as a silly pop-culture obsession, as opposed to the science of SETI). If you are looking for popular UFO books, please visit the UFO documents and books page. "Recently astrophysicist Ken Olum at Tufts University argued (src) that anthropic reasoning applied to inflation theory predicts that we should find ourselves part of a large, galaxy-sized civilization, implying that the "We are alone" solution to Fermi's paradox is inconsistent with our best current theory of cosmology. Beatriz Gato-Rivera, a physicist at the Instituto de Matematicas y Fisica in Madrid, followed up on this (src) with the hypothesis that Olum is correct, but that by design we would be kept unaware of a greatly advanced surrounding civilization. She also argues that modern superstring and M-brane theory further aggravate Fermi's "missing alien" problem. It is quite strange that while our best modern physics and astrophysics theories thus predict that we should be experiencing extraterrestrial visitation, any possible evidence of such in the form of a subset of UFO reports is ignored or ridiculed." -- astrophysicist Bernard Haisch, Ph.D. www.ufoskeptic.org, referring to Inflation Theory Implications for Extraterrestrial Visitation (.PDF) paper by J. Deardorff, B. Haisch, B. Maccabee and H.E. Puthoff, in Journal of the British Interplanetary Society, Vol 58, pp. 43-50, 2005. [R] Ufology: What Have We Learned? J. Deardorff, B. Haisch, B. Maccabee and H.E. Puthoff, J. British Interplanetary Soc., 58, 43-50, 2005. Hiroshi Nakamura, JSE, 17, 409-433, 2003. Peter Sturrock, JSE, 15, 69-95, 2001. Ann Druffel, Robert M. Wood and Eric Kelson, JSE, 14, 583-622, 2000. Richard F. Haines and Paul Norman, JSE, 14, 19-33, 2000. Michael D. Swords, JSE, 13, 685-694, 1999. Bruce Maccabee, JSE, 13, 421-459, 1999. Bruce Maccabee, JSE, 13, 199-211, 1999. Jacques Vallee, JSE, 12, 345-358, 1998. Jacques Vallee, JSE, 13, 359-375, 1998. James Deardorff, J. British Interplanetary Soc., 40, pp. 373-379 (1987). (Note: In the last 2 papers, physicist Dr James Deardorff -professor of atmospheric sciences at Oregon State University- offered the "leaky embargo" hypothesis, which argues that the aliens in charge wish to let us gradually know of their existence and presence, while providing "deniability" to those who can't yet handle that fact. A gradual acclimation will avoid threatening the governmental, financial, cultural and religious foundations on which we depend. Astronomer Polls There have been several public opinion polls in US and Canada, which have shown that 7-9% of the people think they have seen a UFO and almost 50% think UFOs are real -over the years the percentage has ranged from 35% to 57%, the highest was in a Gallup poll of May 1978. However, scoffers often counter-argued that astronomers, who are presumably more knowledgeable about observing and evaluating the skies than the general public, do not see UFOs. The following two polls of professional & amateur astronomers respectively, suggest otherwise. EDITORIAL by Dr. J. Allen Hynek "The reliable (UFO) cases are uninteresting and the interesting cases are unreliable. Unfortunately, there are no cases that are both reliable and interesting." So has written my astronomer colleague, Dr. Carl Sagan, in his book, "Other Worlds." Much of course depends on those two words "interesting" and "reliable", but persons who have made a serious study of the UFO problem will testify that there are indeed some UFO reports that are both interesting and reliable, even when those two words are not used lightly. Support for this statement has come rather unexpectedly from both professional and amateur astronomers. Two independent surveys, one of professional astronomers made by Dr. Sturrock of Stanford University (see feature article in this issue), and of amateur astronomers made by Mr. Gert Herb of the Center for UFO Studies, have brought to light some very interesting UFO sightings made by members of these groups. I must therefore differ with my colleague Dr. Sagan: there are indeed UFO reports which are both interesting and reliable. By UFO reports here we mean reports the contents of which do not submit to logical explanation. I must also differ with the oft-made statement that "astronomers never see UFOs". Apparently, they do and have, and they are just as puzzled as ordinary mortals are. Whoever sees such puzzling sights should not have to wait for a formal survey by questionnaire, but should contribute his data for the benefit of science. They present us with a paradox and, as our masthead repeatedly proclaims, "There is no hope of advance in science without a paradox". It is the things that "don't fit" that lead to breakthroughs. Republished in 1994 in Journal of Scientific Exploration, Vol. 8, No. 1, pp. 1-45, 1994. [R] The Amateur Astronomer and the UFO phenomenon (aka Gert Herb / CUFOS Report) In 1980, a survey of 1800+ members of various amateur astronomer associations by amateur astronomer Gert Herb, under supervision of CUFOS and astronomer Dr J. Allen Hynek (past chairman of the astronomy department at Northwestern University who had been a consultant to the USAF UFO investigations for 20 years), found that 24% responded "yes" to the question "Have you ever observed an object which resisted your most exhaustive efforts at identification?" (Comments by Dr Fil: The Herb/Hynek amateur astronomer poll results were originally published in Fall 1980 issue of CUFOS Bulletin, no longer published. They were reprinted in CUFOS' International UFO Reporter (IUR), May 2006, pp. 14-16. Poll conceived by amateur astronomer Gert Herb as a companion to previously conducted poll by astrophysicist Peter Sturrock of fellow professional astronomers (4.5% reported UFOs in Sturrock's poll). Cooperation with three major amateur astronomer organizations was obtained: Astronomical League, Association of Lunar and Planetary Observers (ALPO) and International Occultation Timing Association (IOTA). The American Association of Variable Star Observers (AAVSO) declined to participate. A total of 7800 questionnaires were mailed out; 1805 people ultimately responded (23%) - a high return rate for a mailer poll. The point is, this is a very good statistical sample of the amateur astronomer membership of these three organizations, one of the main criteria as to whether the poll is scientific. A very low return rate might not be scientific, i.e., a good representative sample of the polled population. The smaller organizations ALPO and IOTA, with total memberships of 726, returned 57% of the questionnaires received, an extremely good representative sample. These are also comprised of people devoted to more specialized aspects of amateur astronomy, requiring special skills and often more specialized equipment. Interestingly this group of more experienced amateurs also reported the highest percentage of UFOs (28%). Instead of being asked whether they had ever seen a UFO (in which the answer might depend on the pollees personal definitions of what constitutes a "UFO"), they were instead asked "Have you ever observed an object which resisted your most exhaustive efforts at identification?" 24% of respondees replied "Yes" to this question. The poll also broke down sightings into five classes, based on trajectories and apparent angular size: Point or extended sources in uniform motion; Point or extended sources in erratic motion, or "object observed at short enough distance as to leave no doubt in observer's mind that something strange was observed." Unfortunately the percentage breakdown was not given in the article. However, it was noted that the last category of weird "close encounter" objects was reported by four of the more senior observers. Of all "high strangeness" cases--either erratic motion or "close encounter"--14 were observed through telescopes (3%) and 17 though binoculars (4%). Of all reported "UFOs", 15% were observed through telescopes and 9% through binoculars. 9 were photographed, with some details provided in article. A companion question was asked about attitudes towards UFOs. 67% thought UFOs certainly, probably, or possibly exist. 33% thought they probably or definitely did not exist. In the early 1950s, Dr Hynek conducted an informal poll of his astronomer colleagues. Among those he queried was Dr. Clyde Tombaugh, who discovered the dwarf planet Pluto. Of 44 astronomers, five (over 11 percent) had seen aerial objects that they could not account for. Most of these astronomers had not widely shared their accounts for fear of ridicule or of damage to their reputations or careers (Tombaugh was an exception, having openly discussed his own UFO sightings). Hynek also noted that this 11% figure was, according to most polls, greater than those in the general public who claimed to have seen UFOs. Furthermore, the astronomers were presumably more knowledgeable about observing and evaluating the skies than the general public, so their observations were arguably more impressive. Similar positions have been taken by other astronomers who have actually studied UFOs, e.g. Why Don't More Astronomers Report Seeing UFOs? by C.Rutkowski. Astronomers Dr J.Allen Hynek and Dr Jacque Vallee have both commented on the attitude of professional astronomers towards UFOs in their books. "MUFON Journal" (formerly SKYLOOK) is the monthly newsletter of MUFON, the largest civilian UFO group. MUFON in cooperation with TBV has made available on-line MUFON journals 1967-2000 in .PDF format (note: earlier editions are scanned and harder to read). Current issues available from MUFON. Flying Saucer Review (FSR) in UK, was established in 1955 and is the world's oldest UFO magazine. Its "golden era" in terms of circulation was in 1960s and 1970s while edited by Waveney Girvan, his successor Charles Bowen and diplomat Gordon Creighton. FSR published articles about UFO incidents in non-English speaking countries, particularly South America and Western Europe. Authors and commentators included Derek Dempster, Leonard Cramp, Brinsley le Poer Trench, Prof. Hermann Oberth, Dr. Carl Jung, Waveney Girvan, Arthur Constance, Wilfred Daniels, M.K. Jessup, and Desmond Leslie, to name a few. In the 1960s contributors included Jerome Clark, Brad Steiger, John A. Keel. Past issues are available as scanned images on CD. Northern UFO News (NUFON) - Britain edited by british UFO reseacher Ms Jenny Randles throughout its existence (from 1974 to 2002), Northern UFO News provided a unique journal of record chronicling reported UFO activity occurring in northern Britain. UFO Afrinews edited by Ms Cynthia Hind from 1988 to 2000, chronicled reported UFO activity in Africa. Related: Archives for UFO Research (AFU) was founded in Sweden in 1973. Today the AFU holds one of the biggest repositories of UFO data and UFO-related folklore in the world. "AIAA Committee looks at the UFO Problem", Aeronautics and Astronautics, December, 1968, p. 12. Golomb S., "The Wheel in the Middle of the Air," Aeronautics and Astronautics, AIAA Sounding Board, August 1966, p. 16.
Letters to AIAA Journal, Nov. 1966, p. 6. Early and Marsh on "Saucer Doctrine". Friedman, S.T., "Flying Saucers are Real ", Aeronautics and Astronautics, Feb., 1968, p. 16. Friedman, S.T., "UFO reports available," Aeronautics and Astronautics, April, 1971, p. 4. Kuettner, J. P., "A New Start on the Whole UFO ProbIem? ", Aeronautics and Astronautics, November 1973. McDonald, James E., "UFOs: Extraterrestrial Probes? ", Aeronautics and Astronautics, Vol. 5, August 1967, pp. 19-20. Sturrock, Peter. A., "UFO Reports from AIAA Members", Aeronautics and Astronautics, Vol. 12, pp. 60-64, 1974. Thayer, Gordon D., "UFO encounter II - The Lakenheath England, Radar-Visual UFO case, August 13-14, 1956", Aeronautics and Astronautics, Sept., 1971, pp. 60-64. AIAA UFO Subcommittee, "UFO: An Appraisal of the Problem", Aeronautics and Astronautics, Vol. 8. No. 11, November 1970, P. 49-51. Carlson J. B., and Sturrock, Peter A., "Stanford Workshop on Extraterrestrial Civilization: Opening a New Scientific Dialog", Aeronautics and Astronautics, June, 1975, pp. 64-65. "Our Extraterrestrial Heritage: From UFO's to Space Colonies", Proceedings of the Joint Symposium, Los Angeles, Calif., January 28, Symposium sponsored by the American Institute of Aeronautics and Astronautics and World Futures Society, 1978. Hynek, J. Allen, "Twenty-one Years of UFO Reports", American Association for the Advancement of Science, 134th Meeting, December 27, 1969. Baker, R. M. L., "Motion Pictures of UFO's", American Association for the Advancement of Science, 134th Meeting, December 27, 1969. McDonald, James E., "Meteorological Factors in Unidentified Radar Returns", Paper Presented at the 14th Radar Meteorology Conference, Tucson, Arizona, Nov. 17-20, 1970. Boston: American Meteorological Society (1970), pp. 456-463. Morgan, David L. Jr., "Evaluating Extreme Movements of UFO's and Postulating an Explanation of Effects of Forces on Their Maneuverability", ASME Design Engineering conference, New York City, May 15-19, 1967, session 10. Earley, G., "UFOs: An Historical Perspective", ASME Design Engineering conference, New York City, May 15-18, 1967, pp. 1-15, session 10. Page, Thornton, "Scientific Study of Unidentified Flying Objects," American Journal of Physics, Vol. 37, No. 10, 1071-1072, October, 1969. Hynek, A., "The Condon Report and UFOs", Bulletin of the Atomic Scientist, April 1969, pp. 39-42. Munday, J., "On the UFOs", Bulletin of the Atomic Scientist, Dec 1967, pp. 40-41. Condon, Edward U., "UFOs I have Loved and Lost", Bulletin of the Atomic Scientist, Vol 15, No. 10. Maccabee, Bruce, "Photometric Properties of an Unidentified Bright Object Seen Off the Coast of New Zealand", Applied Optics, Vol 18, No. 15, 2527-28, 1979. Maccabee, Bruce, "Photometric Properties of an Unidentified Bright Object Seen Off the Coast of New Zealand -- Author's Reply to Comments", Applied Optics, 19, 1745, 1980. McDonald, James E., "The Condon Report", Icarus, Vol 11, #3, November 1969, pp. 443-447. Dickinson, Terence, "The Zeta Reticuli Incident", Astronomy, December 1974, 32 pages. "UFO's probably exist", Industrial Research and Development, Vol. 13, No. 4, April 1971, p. 75. "Did UFOs Go Away? ", Industrial Research and Development, Vol. 21, No. 2, February 1979, p. 191. "Good Chance UFOs Exist in Some Form", Industrial Research and Development, July 1979, p. 139. "Libel Suit May Develop From UFO Hassle", Scientific Research, may 13, 1968, pp. 11-12. Baker, Robert M. L., Jr., "The UFO Report: Condon Study Falls Short", Scientific Research, April 14, 1969, p. 41. Armagnac, Alden P., "Condon Report on UFOs: Should You Believe It? ", Popular Science, April 1969, pp. 72-76. Hersey, Irwin, "UFOs and the Condon Report: Are All the Answers in? ", Engineering Opportunities, April 1969, pp. 39-42. McDonald, James E.,"The Dissenting View", Engineering Opportunities, April 1969, p. 33. Mallan, Loyd, "The Condon Report: Fact or Fiction? ", Science and Mechanics, 40.5, May 1969, pp. 38-40, 86,88,90. Hynek, J. Allen, "The UFO Phenomenon: Laugh, Laugh, Study, Study", Technology Review, Vol. 83, No. 7 July 1981, pp. 50-58. Ridpath, Ian, "Interview with J. Allen Hynek", Nature, Vol. 251, October 1974, p. 369. Hynek, J., "Unusual Aerial Phenomena", Journal of the Optical Society of America, April 1953. Baker, Robert M., "Observational Evidence of Anomalistic Phenomena", Journal of Astronautical Sciences, Vol. XV, No. 1, pp. 31-36, Jan-Feb, 1968. Baker, Robert M., "Future Experiments on Anomalistic Observational Phenomena", Journal of Astronautical Sciences, Vol. XV, No. 1, pp. 44-45, Jan-Feb, 1968. Walker, Sydney, "Establishing Observer Creditability: A Proposed method", Journal of Astronautical Sciences, Vol. XV, No. 2, pp. 92-96, March-April, 1968. Salisbury, Frank B., "The Scientist and the UFO", Bio-Science, Vol. 17, no. 1, 1967. Powers, William, "Analysis of UFO Reports", Science, Vol. 156, 7 April, 1967. Hynek, Allen J., "UFO's Merit Scientific Study", Science, October 21, 1966. Markowitz, W.,"The Physics and Metaphysics of Unidentified Flying Objects", Science, Vol. 157, 1967. Boffey, Philip M.,"UFO Project: Trouble on the Ground", Science, Vol. 161, July 26, 1968, pp. 339-42. Boffey, Philip M.,"UFO Study: Condon Group Finds No Evidence of Visits from Outer Space", Science, Vol. 163, January 17, 1969, pp. 260-62. Murray, Bruce C.,"Reopening the Question", Science, Vol. 177, August 25, 1972, pp. 688-89. Holden, Constance,"Air Force Bestows on National Archives a Trove for UFOlogists", Science Vol 193, August 20, 1976, pp. 662-663. Friedman, S.T., "More on UFO's", Physics Today, P. 97, January 1971. Powers, W. T., " Case for "real" UFO's", Physics Today, P. 14, June, 1970. "Condon Study Rebuts UFOs; Critics Offer Own Version", Physics Today, Vol. 22, Nr. 3, March 1969, p. 67, p. 71. "Edward Condon: A physicist Never Afraid of a Fight", Physics Today, Vol. 22, Nr. 3, March 1969, pp. 66-67. Rothberg, Gerald, "UFOs: Fact or Fiction? ", Physics Today, Vol. 22, Nr. 12, December, 1969, pp. 69-71. Hynek, Allen J.,"How to Photograph a UFO", Popular Photography, March 1968, p. 69-110-112-114. Brandenburg, John E., DiPietro, Vincent, and Molenaar, Gregory, "The Cydonian Hypothesis", Journal of Scientific Exploration, Vol. 5, No. 1, 1991, pp. 1-27. Bounais, M., "Traumatology as a Potent Tool for Identifying Actual Stresses Elicted by Unidentified Sources: Evidence for Plant Metabolic Disorders in Correlation with a UFO landing", Journal of scientific exploration, Vol. 4, No. 1, 1990, pp. 1-18. Bramley, William, "Can the UFO Extraterrestrial Hypothesis and Vallee Hypotheses Be Reconciled? ", Journal of Scientific Exploration, Vol. 6, No. 1, 1992, pp. 3-11. Guerin, Pierre, "A Scientific Analysis of Four Photographs of a Flying Disk Near Lac Chauvet", Journal of Scientific Exploration, Vol. 8, No. 4, 1994, pp. 447-469. Haines, Richard and Vallee, Jacques, "Photo Analysis of an Aerial Disc Over Costa Rica", Journal of Scientific Exploration, Vol. 3, No. 2, 1989, pp. 113-131. Haines, Richard and Vallee, Jacques, "Photo Analysis of an Aerial Disc Over Costa Rica: New Evidence", Journal of Scientific Exploration, Vol. 4, No. 1, 1990, pp. 71-74. Haines, Richard, "Analysis of a UFO Photograph", Journal of Scientific Exploration, Vol. 1, No. 2, 1987, pp. 129-147. Henry, Richard C., "UFOs and NASA", Journal of Scientific Exploration, Vol 2, No. 2, 1988, pp. 93-142. Maccabee, Bruce, "Analysis of the Images of a Cluster of periodically Flashing Lights Filmed Off the Coast of New Zealand", Journal of Scientific Exploration, Vol. 1, No. 2, pp. 149-190, 1987. Maccabee, Bruce, "Strong Magnetic Field Detected Following a Sighting of an Unidentified Flying Object", Journal of Scientific Exploration, Vol. 8, No. 3, 1994, pp. 347-365. Sturrock, Peter, "An Analysis of the Condon Report on the Colorado UFO Project", Vol 1, No. 1, 1987, pp. 75-100. Sturrock, Peter, "Report on a Survey of the Membership of the American Astronomical Society Concerning the UFO Problem", Journal of Scientific Exploration, Vol. 8, No. 1;2;3, 1994, pp. 1-45;153-195;309-346. Swords, Michael, "Could Extraterrestrial Intelligences be Expected to Breathe Our Air? ", Journal of Scientific Exploration, Vol. 9, No. 3, 1995, pp. 381-392. Velasco, Jean-Jacques, "Report on the Analysis of Anomalous Physical Traces: The 1981 Trans-en-Provence UFO case", Journal of Scientific Exploration, Vol. 4, No. 1, 1990, pp. 27-48. Vallee, Jacques, "Return to Trans-en-Provence", Journal of Scientific Exploration, Vol. 4, No. 1, 1990, pp. 19-26. Vallee, Jacques, "Five Arguments Against the Extraterrestrial Origin of Unidentified Flying Objects", Journal of Scientific Exploration, Vol. 4, No. 1, 1990, pp. 105-117. Vallee, Jacques, "Towards a Second-Degree Extraterrestrial Theory of UFOs: A Response to Dr. Wood and Prof. Bozhich", Journal of Scientific Exploration, Vol. 5, No. 1, 1991, pp. 113-120. Wood, R., "The Extraterrestrial Hypothesis is Not That Bad", Journal of Scientific Exploration, Vol. 5, No. 1, 1991, pp. 103-112. Academic publications about UFOs. There are several PhDs on UFOs, but nearly all dismissed out of hand the notion that UFOs could be genuinely anomalous in nature. Following established trends, and more so in recent decades, academics often treated UFOs as a psycho-social phenomenon, i.e. a modern space-age mythology and sought to explain UFO close encounters as culturally shaped hallucinations and visionary experiences. Generally speaking, academics who embraced psycho-social theories came mostly from the humanities and social sciences backgrounds, had little interest in empirical science as such and didn't concern themselves much with the evidence associated with UFO reports (e.g. radar/visuals, CE2s). Nearly all defined UFOs as what clueless individuals think they see and, beyond that, what UFO "contactees" talk about, i.e. they usually did not discriminate between outlandish claims and those others considered credible. Below is a (most probably incomplete) list [todo: find PhDs in German]. Flying Saucers - Fact or Fiction? Should the Air Force Reopen Project Blue Book ? The Boundaries of Orthodoxy: A Folkloric Look at the "UFO Phenomenon"
"The UFO Movement: A Sociological Study of UFO Groups"
OVNI : un tabou scientifique ? Pictorial Memory and UFO Phenomena: How Reliable is Eyewitness Testimony ? Approche sociopsychologique du phenomene O.V.N.I. Pop Culture and the UFO Narrative: Who's Buying It, Who's Selling It and Who's Not Telling It? Comparing stories of extraterrestrials with stories of fairies. Mon dieu un OVNI. Du phenomene ovni a ses derives religieuses, en France de 1950 a nos jours. Abstract: Although UFOs, flying saucers, and extraterrestrials are traditionally considered to be concepts associated with the 'West', indigenous people are also familiar with these ideas. In a remote Aboriginal community in Central Australia, Warlpiri residents regularly sight and discuss UFOs. In addition to reflecting attributes of extraterrestrials found in film and television portrayals, Warlpiri descriptions of 'the aliens' also emphasize an involvement with the environment, local cosmological themes, and the engagement between Aboriginal and non-Aboriginal Australians. Consequently, Warlpiri UFO narratives are one way in which the boundedness of, and interplay between, Aboriginal and non-Aboriginal realms can be explored. Abstract: Why it is that modern states do not take Unidentified Flying Objects seriously? Wendt and Duvall offer what they call an 'epistemology of UFO ignorance' to explain why modern states systematically resist the notion that extraterrestrial life forms might both exist and travel to earth. They emphasized their militant agnosticism about whether UFOs really are extra-terrestrial, saying that they are interested only in how and why the ignorance is maintained. If academics' first responsibility is to tell the truth, then the truth is that after 60 years of modern UFOs, human beings still have no idea what they are, and are not even trying to find out. That should surprise and disturb us, and cast doubt on the structure of rule that requires and sustains it.